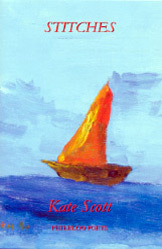 Kate Scott has published short fiction and poetry in literary magazines in the U.K. and abroad. She received a distinction on completing a M.Litt in Creative Writing at St. Andrews University. She lives in London with her husband and baby daughter. Stitches is her first collection of poetry. they bluster on to the platform. their sallowness waiting to ripen. like the sly lids of geckos basking on walls. medicated face wash, fresh sweat. They dream of being men, of walking in the wide spaces. like a train suddenly split to two different tracks. taut and nervous as colts with the waiting. Cover illustration: by Carter MacLeod, aged six.